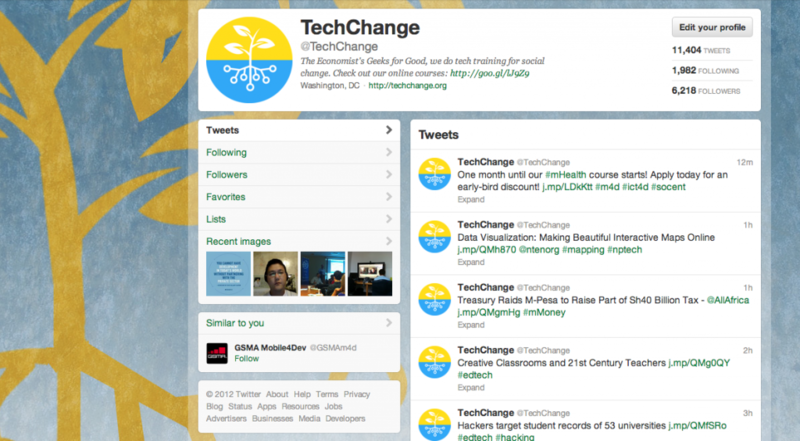 6 Tech Tools for Social Entrepreneurs: The TechChange Secret Sauce? Interested in learning with TechChange? Check out our upcoming course with the mHealth Alliance: Mobile Phones for Public Health. Class starts on Nov. 12! This month we introduced a new online class on Technology, Innovation and SocialEntrepreneurship in partnership with Roshan Paul, cofounder of the Amani Institute and senior staff member at Ashoka. The class has already attracted much interest from 30 students in 10 countries, including speakers from Groupshot.org, Shift.org, Digital Green, and Architects of the Future. While we offered the class as part of the unprecedented enthusiasm around the ability of private-sector innovators to solve global problems, the last two weeks have made clear how the availability of new tools has been inseparable from the growth of TechChange as an organization. The path from starting our firm two years ago to being a recognized B Corp can be told first through our team members, but also through the technology that we’ve chosen to use to further our institutional goals. While we usually avoid taking a tech-centric approach to business and education, these tools have solved a variety of management challenges for us, including core learning platforms and content management, community engagement, talent recruitment, relationship management, collaborative document editing, and task management. 1. WordPress (Content Management): Everything we do at TechChange that is website related is based on WordPress. Our main TechChange.org site, and our course site are heavily customized versions of WordPress. We are big believers in responsive design and WordPress gave us the framework that we needed to build a system that could be managed by non-programmers. Some of our favorite plugins: GravityForms, Advanced Custom Fields, WordPress Database Backup, Disqus, Google Analytics for WordPress, and BuddyPress. But ultimately, whenever we’re asked why we chose to go with WordPress, we have to be honest: We chose the highly engaged WordPress developer community first and then figured out if the tech could meet our needs going forward. 2. Twitter (Community Engagement): Twitter has been absolutely crucial to our success. We got a late start (May 2010) but in two years we’ve grown to 6200 followers with an average of about 300 new followers a month thanks to the incredible direction of social media whiz kids Alex Priest and TJ Thomander. The secret sauce: our following has grown in direct relation to the number of tweets we’ve sent out every day. We like to aim for tweeting 25-40 times a day and so should you. Some tools we like: Crowdbooster, BufferApp, TweetDeck and Friendorfollow. 3. Idealist.org (Talent Recruitment): Whenever we hire someone new, we always post on Idealist.org, mostly because we care about attracting people who are passionate about social change in addition to tech nerds. For us, Idealist has been the best place to find them. If you’re hiring for a new position, we’d highly recommend spending the $70 for a job announcement. Having an open web form application is also a great way to constantly be on the lookout for the right talent. Check out the TechChange application here. 4. Salesforce (Relationship Management): Where would we be without the web standard in customer relations management? Salesforce allows us to easily catalog everyone who applies for our courses as well as clients who hire us for custom courses. There is an incredible diversity of tactics organizations can use to tap into the power of Salesforce. We love what the folks at Vera Solutions are doing in terms of helping other organizations use Salesforce to enhance their M&E work and are excited to have CEO Taylor Downs speaking in our class this week. Salesforce has a number of discounts available for nonprofits and B corps. 5. Google Docs (Collaborative Writing): Google Docs is a our go-to way to share documents and collaborate in real-time. We do so much within this framework from managing cash flow, to sharing spreadsheets of student lists, to editing proposals. You do need a gmail account to use them and some folks may prefer not to be too cloud dependant but we’ve been very happy with this tool over the past two years. 6. Asana (Task Management): We’ve struggled over the past two years to find a good task management tool that everyone on the team actually uses. We tried Basecamp, Open Atrium and a bunch of others with limited success. The beauty of Asana is that it integrates nicely with Gmail. The interface is very intuitive and so far this has been the best one yet. Other tools and platforms we love: Github, Rackspace, Quickbooks Online, Google Analytics, and Paypal. What about you? What tools or platforms have been the most valuable for you and why? Feel free to share them below. Thanks for including Idealist, Nick! And we are in great company — this is a fantastic list of resources. Thanks for sharing. @twitter-15096075:disqus Glad you liked it — miss any good resources? Would love to learn from you and your community as well. – Trello : we couldn’t live without this awesome project management tool! – We’d put OnePage CRM up there against Salesforce (especially after Salesforce’s blantant disregard for social enterprises around the world by trying to Trademark the term, which they recently backed down from. – Spotify : keeping the tunes rolling to provide us the soundtrack to social enterprise startup life! I think proofhub too should be in this list. This tool helps a lot to manage team as well as projects. I suggest you guys to try this tool at least once. I have been rehearsing large portions of these applications since I purchased my first iphone and ipad. Be that as it may now I am completely dedicated to proofhub.com. This product holds both free bundle and a paid bundle. You can attempt this product free of charge, then pick an arrange that suits your needs. Very useful and interesting list for the social users. I also using google doc and salesforce..
Bitrix24 is amazing and free.